Stadio Friuli, as it’s still known among fans, was recently reopened after almost complete reconstruction. Now named Dacia Arena, the stadium has three new stands joining the main western one. Before construction began, the west side was thoroughly renovated, including paintwork on its facades. However, now Udinese announced a step further. In their project’s last phase the club want to improve the visual side of the west stand. The concrete façade will be covered with satin steel diamonds, like all three others. 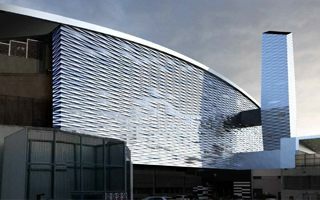 So far the metallic cladding consumed roughly €1 million. Another important change will see the roof extended outwards, particularly to the north and south. What comes as potentially most surprising step, the entire domed roof will be covered with synthetic grass. This way Dacia Arena is intended to mimic the surrounding hills. Detailed time frame for the works was not revealed so far, but Udinese did reveal in recent days that they already have an approval for running the project.